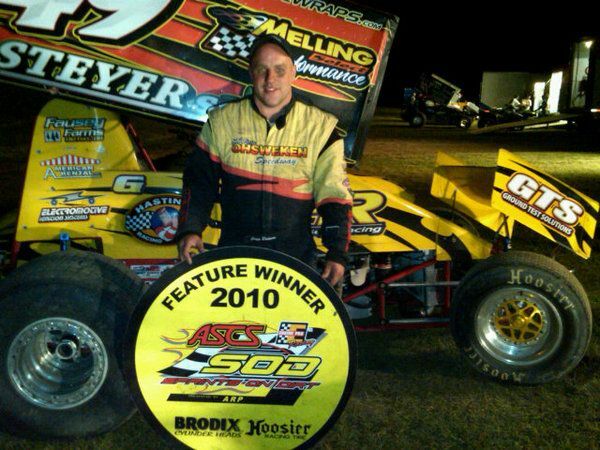 OWENDALE, Mich. (August 28, 2010) – Gregg Dalman kept his championship hopes alive by winning Saturday night’s Engine Pro ASCS Sprints on Dirt presented by ARP feature at Owendale Speedway. Dalman conserved his tires and made a daring outside pass of Davey Brown and pulled away during a late race restart to take the win. Brown and rookie of the year point leader Gavin Hunyady started on the front row for the 25-lap feature event. Brown took the lead with Dalman moving past Hunyady for second. The top three cars opened up some space until both Ryan Grubaugh and Ben Rutan moved Hunyady back to fifth. Brown’s tactics passing slower cars enabled him to gain some breathing distance, but Dalman, Grubaugh, and Rutan were able to keep pace. On lap 17 things started to heat up as Brown’s car was visibly not coming off the corners as well and everyone behind him decided to pounce. Dalman tried to set Brown up entering the corner high and diving low coming off, but could not make the pass. Grubaugh and Rutan battled for third back and forth with Grubaugh maintaining the position. Then with six laps to go Dalman drove to the middle of the track in turns one and two and motored down the backstretch into the laad. Even with a late race caution Dalman pulled away after the restart to victory. Brown held on for second with Grubaugh, Rutan, and Dain Naida coming from fifteenth to fifth rounding out the top five. Brown, Grubaugh, and Dalman won heat race events while Tim Champlin won the fast car dash. Engler Machine and Tool Heat Race #1 (8 Laps): 1. 10x – Davey Brown, 2. 187 – Gavin Hunyady, 3. 8 – Tim Champlin, 4. 12 – Brett Lane, 5. 22t – Tank Brakenberry, 6. 6n – Dain Naida. Lane Automotive/Comp Cams Heat Race #2 (8 Laps): 1. 3w – Ryan Grubaugh, 2. 46 – Robert Huisken, 3. 22 – Aaron Shaffer, 4. 70 – Jim Lingar, 5. 2t – Ralph Brakenberry. DNS: Louie Carufel. TULSA, Okla. (August 23, 2010) – The Engine Pro ASCS Sprints on Dirt presented by ARP makes their final trip up to the “thumb” on the east side of Michigan to compete at Owendale Speedway in Owendale, Michigan. This is the second appearance of the season at Owendale for the ASCS SOD series and another leg in the 2010 MAHLE / Clevite Short Track Challenge. Dain Naida will look to sweep both Owendale races in 2010, after winning the first event on July 10th that started a two race win streak. Naida also leads the standings in the Short Track Challenge by 31 points over Davey Brown. In the race for the overall 2010 ASCS SOD championship Ryan Grubaugh currently holds a 64 point lead over Gregg Dalman. Both drivers are attempting to win their first series championship. A mid-afternoon downburst has forced the cancellation of tonight’s ASCS Sprints on Dirt racing program at South Buxton Raceway. Things were looking promising as only light sprinkles were falling until heavy rain hit the track after 3 p.m.
Track officials made the call to cancel the program at 3:30 p.m. as the outburst will make it impossible to get the track ready for racing. There is no word if the Sprints On Dirt show will be rescheduled. Next Saturday will be the Country 92.9 Night At The Races.